UPDATE: After closer inspection, we're pretty sure that the screenshot is a fake. Sorry, guys! 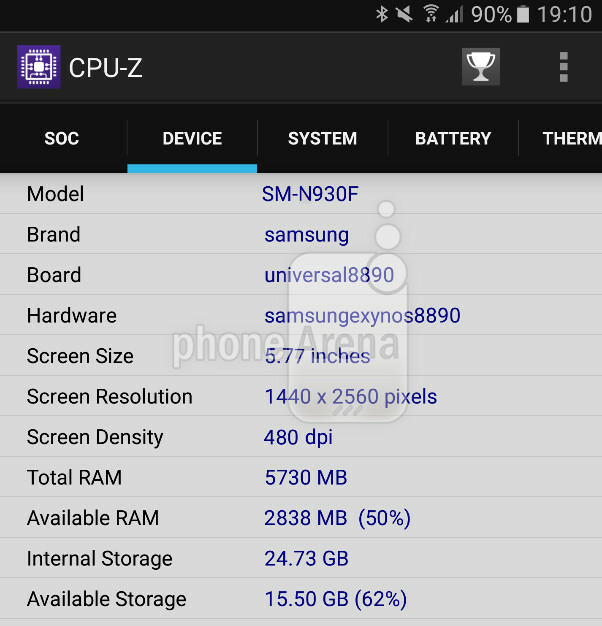 A CPU-Z screenshot sent to us by someone claiming to be a Samsung employee, reveals some information on the upcoming Samsung Galaxy Note 6. According to CPU-Z, the Galaxy Note 6 will have the model number SM-N930. The screen will be 5.77-inches with a 1440 x 2560 QHD resolution. The phablet, as has been rumored, will carry 6GB of RAM with 32GB of native storage. The Samsung Exynos 8890 SoC is under the hood. Our source tells us that the Galaxy Note 6 will have a similar design to the Samsung Galaxy S7 and Samsung Galaxy Note 5. It is slightly thicker than the latter. A 3700mAh battery keeps the lights on, and the phone will come with an IP68 certification giving it dust and water protection for the very first time in the Galaxy Note series. A separate report published on Saturday revealed that the internal code name of the Samsung Galaxy Note 6 is "Grace." It also revealed the model numbers for the Verizon (SM-N930U_NA_VZW), AT&T (SM-N930U_NA_ATT), T-Mobile (SM-N930U_NA_TMB) and Sprint (SM-N930U_NA_SPR) branded versions of the device. How is 2.8GB RAM free not enough? Out of 6, that's too much of a loss. They need to optimize their OS, the hardware sounds like a beast. How is free RAM any better than used one. If you need more RAM, they can always clean up unused stuff. This just shows that the system is doing good work of at least using the RAM. What good is a 6GB RAM if the system doesn't use more than 1GB. People who have no idea how linux memory management works should stop acting like they know it all. I agree .. if the rams are used then this is good! Yeah, people keep complaining about RAM usage, if people want under 1.5Gb of RAM consumption they better off with a 2GB system RAM. What are the use of RAM if not going to be utilized? That's what have been saying since the Note 3 debuted with 3GB RAM. Unused RAM is a waste, and it cause system instability. I have a serious question regarding that. While I know that Linux continuously uses RAM, lets apps run in the background etc. I don't really get why it should be positive that the system is already using 3GB of that RAM. If you lower the usage of the system it should be better, no? Why should it be better? If the system uses 2GB and it needs 3, some things will need to be reloaded into memory causing slowdown. This is not system only. The guy might be running 10 apps in background for all we know. The system may also cache some files you recently used, that's called disk bigger cache. In short, the more memory you have, the more system can store in the memory and the note stuff opens faster. Okay, we don't know how many apps were running in the background when this screenshot was taken, that's right. But, ASSUMING there are no apps running (right now it's actually not specifically regarding this screenshot but my personal understanding - so 'assuming' should be fine :P) in the background, I think it's better to have less RAM used while not having apps open in the background. To make it clear I exaggerate: if you have 4GB RAM available but 3,8GB are used without having open any app, wouldn't it be better to have less RAM used? Or does this way of thinking contradict with the way Linux handles RAM as well? Depends on what content is cached. The system should ensure only the relevant stuff should stay in background. No, more RAM free is not good. If you have 4GB RAM and 3.8 GB is filled with relevant content, it's better than a 4GB RAM with all of it empty. Let me take an example to make it clear. Suppose you have two systems. One that caches stuff intelligently, caches all your relevant apps, files you recently opened and so on. And other one which kills stuff but has more RAM available. Now open an app on both systems. More often than not, the app will be in memory in the first system and the second system will load it from storage, making it slower. Let's consider another scenario. In this case, first system has only 200MB free and second is 2GB free. Both are not running any apps. Now you open a bunch of apps. The first system should be smart enough to clear the junk it had earlier and allocate the memory to these newer processes. In this case too, both systems will behave similarly. The issue arises when a system keeps the junk in memory but applies aggressive management to your recent apps. That's what happened with Samsung last year. BTW, if you want to know what caused bad memory management in Samsung devices, I can explain in detail. Just ask. All in all, more free RAM isn't better than less free RAM since RAM can always be cleared to make room for important and recent processes. Most linux systems use LRU(least recently used) eviction policy. Hope this makes it clear :) It's not how big the free memory is, it's how you use it. Yes, correct. So what happened with touchwiz is that samsung set the limitation in kernel to only allow 5 user programs to stay in memory. When you opened 6th app, 1st gets closed. Now if you Aves from 1 to 6. All will reload since when you access first app second gets closed, even you open second third gets closed and so on..... ^this is also the reason either no app reloads or all do in traditional youtube speed tests. If you even exceed one app beyond the limit and access it in order they were opened, all will reload. What the 5 limit also did was allow a lot of touchwiz junk to run in background since user apps were not allowed to claim much memory and kick the junk out. Leading to poor battery life. They increased the limit to 12 in marshmallow for s6 and I guess the same holds for the snapdragon s7. If you access more than 12 apps and access them starting from 1, all reload. However, if you load them in reverse order, you will have 12 recent apps in memory. Which is what the system expects you to do. The apps which you accessed recently have a higher probability of getting accessed again. This is why speed tests are bogus too. Anyway, the exynos s7 seems to have no limit on number of apps. So it can keep on caching apps until only apps and kernel is left. And then apps will start getting kicked. Okay, wow, that's interesting :D Thanks again for your explanation. But why would I even want to set a limit to user opened apps? The system should be smart enough to clear the RAM anyway if there isn't enough available, right? So setting any limit seems to be kind of senseless to me. Saving battery shouldn't be a reason as there surely are other mechanics to do so, I guess. Regarding the S7 SD820 and Exynos, why does Samsung think the SD820 version needs a limit while the Exynos one doesn't? How come you know this stuff? "But why would I even want to set a limit to user opened apps?" More apps running in background = more battery drain. "Regarding the S7 SD820 and Exynos, why does Samsung think the SD820 version needs a limit while the Exynos one doesn't?" Beats me. But I guess it's due to lower efficiency of the SD 820. They did it so that the 820 version can have comparable battery life. The exynos can use the lower powered A53 cores to run background tasks. It could also be poor or lazy optimization. "How come you know this stuff?" I'm in the field of computer science. CPU efficiency should give a better experience'but not all background apps are running constantly. Reason I like nexus phones' better performance with my nexus 5 SD 800 & 2 GB's ram. You can't compare RAM efficiency to nexus 5. 32-bit systems consume a lot less RAM compared to 64-bit ones. Also 1080p helps. Even my S4 runs awesome with 2GB RAM. Yup. My LG G2 flies high with just 2GB RAM.. It's actually good for Android to have more ram used than not. Clearing it often uses more battery since Android will just start re-caching it all again. No. This is normal. Memory needs to be maintained whether it is empty or not, and having something in memory means it is instantly available if you need it again. Clearing things out of memory manually means if you go to that app again, Android has to reload it from slower, more battery-intensive SRAM. The ideal state for Android is to have the memory nearly full of stuff you've used recently (in case you want to use it again soon! ), with a little reserve left over so it doesn't have to waste time making free space if you want to load up something new. If you have specific apps that are requesting very large amounts of memory, taking the time to clear them manually will sometimes make it seem like other apps will load faster, and they will, but only because all of your wait time was when you hit "clear", not when you are waiting for the new app to fire up. The net time spent was the same. On the other hand, if you clear 20 apps out of memory to kill that one hog, then you run all 20 of them again, you've wasted time both clearing and re-loading them. If you're switching to an entirely different application that needs lots of memory, it can sometimes be marginally useful to clear all your running apps, but you're just doing what Android would have done more judiciously and efficiently.